Join us for a pub crawl through New York's most fashionable and young neighborhoods. We'll bar hop through hand picked bars and clubs, meet new people, skip the line, and enjoy exclusive drink specials all guided by fantastic local hosts. 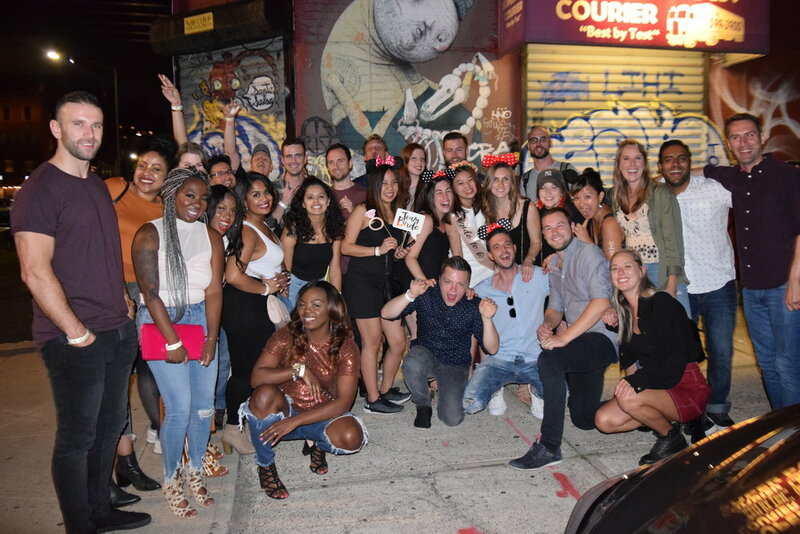 Our Brooklyn pub crawls are a combination of a party and a bar tour. After checking in at our start time, you'll grab a drink and meet the group for the evening. We then move as a group from venue to venue on a route that has been carefully crafted in advance . Every unique spot we visit offers the crawl exclusive drink specials and/or free entry. You'll meet new people, explore a new nightlife scene, enjoy some great drinks and party hard. Our hosts are equipped with a high quality camera, to take great photos that will be sent to you after the crawl. Experience NYC like a local and crawl Brooklyn with us! . When you think Brooklyn chic, you think Williamsburg. This neighborhood is jam packed with trendsetters and insta-worthy sites, and the nightlife scene is no exception. We’ll get the party started at a quintessential Williamsburg cocktail bar and then move to three other venues that’ll keep the party going all night long. Get ready to mingle, drink, and fall in love with Williamsburg. Dive deeper into all that Brooklyn has to offer as we explore Bushwick, one of Brooklyn’s most vibrant and scenic neighborhoods. We’ll meet up in a spectacular cocktail lounge to get started, and then move as a group to 3 other bars that’ll show you why Bushwick will be your new favorite weeknight spot. Less rowdy of the two routes, casual and creative is what Bushwick is all about, so we’ll start off a bit on the earlier side and let the night go from there. Crawl Brooklyn also leads private pub crawls and tours for groups or special occasions. Please email info@crawlbrooklyn.com to discuss your perfect Brooklyn experience. Classical singer and whiskey enthusiast, Sarah loves pub crawling with new friends from around the city and world. A proud New Yorker, she insists that all visitors get a taste of the real New York, and loves creating the perfect night out for everyone joining Crawl Brooklyn. She can always give enthusiastic recommendations on the best music, theater and Chinese food in town. Fiction writer extraordinaire, Katie is a lifelong New Yorker who has explored all pockets of the city's nightlife. One of the friendliest people you will ever meet, her perfect night ends in crazy dancing surrounded by friends and followed by pizza. Williamsburg is the neighborhood that can keep up with her energy, but she also loves sitting down over a good craft beer. Ask her to tell you about the best guacamole in NYC. Bustling back and forth between NYC and DC, Elizabeth is a quick talking east coaster (and if you give her wine she'll talk and drink even quicker!). Known far and wide for her sense of humor and stellar dance moves, she is a blast of a host. Ask her about the best dog spotting locations in town. Our pub crawls are a combination of a party and a bar tour. After checking in at our start time, you'll grab a drink and meet the group for the evening. We then move as a group from venue to venue on a route that has been carefully crafted in advance . Every unique spot we visit offers the crawl exclusive drink specials and/or free entry. You'll meet new people, explore a new nightlife scene, enjoy some great drinks and party hard, all with our great hosts leading the way. WHAT MAKES CRAWL BROOKLYN DIFFERENT? We’re a women-owned and operated business which already makes us different, but our bars are different, too. These routes have been carefully crafted with hand selected bars that show New Yorkers and tourists alike an authentic Brooklyn night out. None of that commissioned or incentivized nightlife stuff is going on here, just great bars with great Brooklynites. WHY IS IT BETTER TO GO ON A CRAWL THAN ON MY OWN? Besides discovering new bars and meeting new people, our pub crawls offer exclusive drink specials and/or free entry at great venues. You won’t be getting these deals going out on your own. How long do the crawls last? The Williamsburg crawl begins at 8:30pm, and the Bushwick crawl begins at 7:30pm, both lasting for approximately three hours until we arrive at our final venue. From there it's up to you how late you want to stay out, but we doubt you'll want to rush home after coming out with everyone at Crawl Brooklyn! This is Brooklyn; casual cool is the name of the game. Wear something that makes you feel great. We keep our bars and clubs a secret until you're on the crawl so that we can bring you to the best places. After purchasing your ticket you will receive the address of our first bar. Each venue offers something a bit different as we aim to please all kinds of party people. Our crawls are walking only. Don't worry, the venues are no more than 5 minutes from one to the other and it gives us a great chance to talk and explore these exciting neighborhoods. I'm on my own, is that okay? Yes! Pub crawls are perfect for going out solo as you'll join our big group and meet all sorts of people. My Large group wants to join a crawl, is that okay? Yes! The more the merrier! Our crawls are a great way to celebrate an occasion or just mix up your usual social groove. Pub crawls have the added advantage of taking the responsibility off any one friend and having our hosts deal with the logistics of going out with a large group so that you can relax and enjoy.